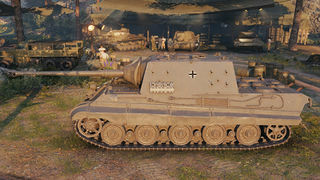 Der 8,8 cm Pak 43 Jagdtiger ist ein deutscher premium Jagdpanzer der Stufe 8. 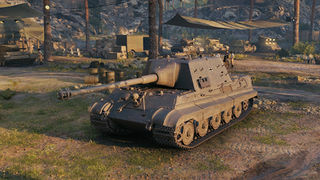 The Jagdtiger 88 was removed from the German Tech tree and in game store in patch 9.10. If "tracked" while going full speed, the momentum of such weight will turn the tank 90°, potentially exposing its thin sides. Weakspot shooting is mandatory in this tank, as 203mm may not cut it on tier IX and some tier VIII opponents. 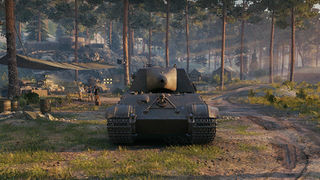 Drivers of this tanks should get familiar with where to shoot on most opponents for damage. The accuracy and rate of fire will handle the rest. Reliably detracking enemies is also essential, as the gun fires faster than the speed at which a 100% crew with 100% repair can repair the track for most tanks. Not only can this save you from flankers, but it can also earn you "damage on detrack" bonuses on tanks that you cannot reliably penetrate from your side. At all times, be wary of self-propelled guns (SPG). Tier 7 and above SPGs can end your tank in a single hit, especially if you expose your flat side armor to them. Your large size and slow speed make you an arty magnet, and with the potential for top tier SPGs in 8.6, this is an even worse issue. In addition, the lower glacis is very weak and should be hidden - hull-down tactics or a large rock may suffice to protect it. Tier 9 tanks, along with the T34 and tier 8 tank destroyers, can easily crack your upper front plate and even your superstructure. If you find yourself in a battle tier 9 match, switch to a purely supportive role. The Jagdtiger's actual top speed is 34 km/h. However, despite mounting a lighter gun than the tier IX Jagdtiger's 12,8 cm Pak L/66, its top speed is only 28 km/h.